Jeremy McQueen is a dancer and choreographer in New York City, and the artistic director and founder of The Black Iris Project, a ballet collaborative and education vehicle which creates new, relevant classical ballets that celebrate diversity and Black history. By harnessing the Black community’s inherent creative spirit, The Black Iris Project encourages and inspires youth of color to pursue art, movement and music. 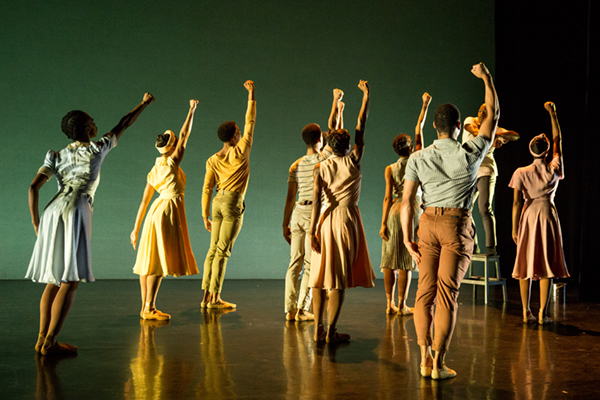 Jeremy shares why it’s important to create ballets with Black narratives, as well as how the ballet world might integrate more people of color. Can you tell me a little about your history and how you founded The Black Iris Project? The Black Iris Project officially started in 2016, but it really got its start when I was given an award by the Joffrey Ballet in 2013 called the Choreographers of Color Award. As part of that application process, I had to put together a proposal of the type of ballet I would create for the organization. I had just found out that my mom had been diagnosed with breast cancer and was undergoing chemotherapy treatment 3,000 miles away from where I live in New York. I was really shaken up and so, a day or so later, a friend and I decided to go to the Metropolitan Museum of Art. I fell in love with a painting by Georgia O’Keefe called Black Iris III. Something about it really struck me. It’s like a yin yang; the top half of the painting is light, floral and effervescent, while the bottom half is deeply rooted in dark, rich colors. I kept coming back to this painting; it moved me. I decided to combine how I was feeling about my mother and how much strength and courage she was mustering with how the painting made me feel, and that was my choreographic proposal to the Joffrey Ballet. I was so thrilled when they accepted my proposal, gave me the award, and invited me to come to Chicago to bring the ballet Black Iris to life. 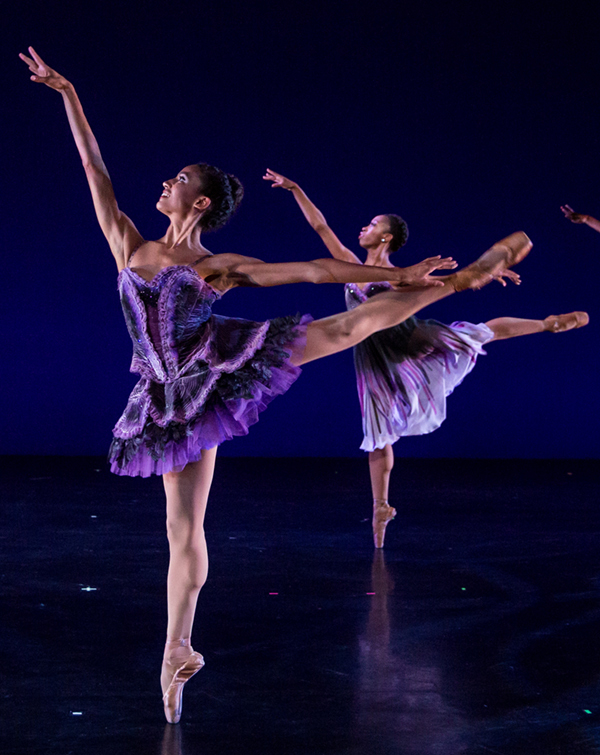 The ballet itself is a tribute to three Black women in my life who I feel really personify what it means to be a Black woman – having strength and courage as well as caring and comfort. My mom and these other women had to step up when my dad was not able to or was not available while I was growing up. The piece became a tribute to them and to Black womanhood. Through that experience, I met Nardia Boodoo, who now dances with The Washington Ballet. She was one of very few Black women in the Joffrey institution. I gravitated toward her; I saw so much beauty and talent in her that was just yearning to be nourished, so I gave her the opportunity to dance a lead in my ballet. We both grew together in talking about our experiences, especially sharing my experience growing up as one of very few Black ballet students in various schools around the country. It encouraged her along her journey and what she’ll have to pull from internally in order to push barriers and challenge what we face sometimes as people of color in ballet. I really loved being able to mentor and connect with Nardia as well as explore Black history through ballet, which I had never really done before. 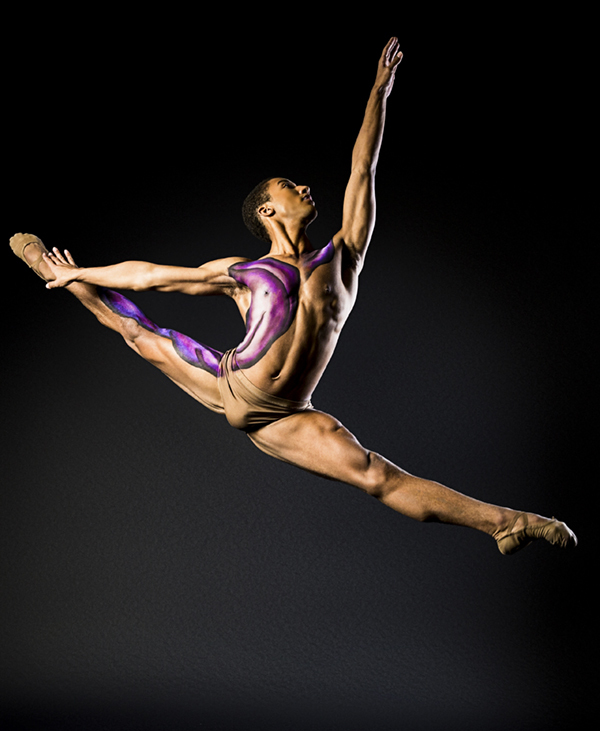 In 2016, I created The Black Iris Project – a collaborative of emerging artists across disciplines, specifically bringing together Black ballet dancers to connect and talk about our experiences, as well as to find ways to continue to muster the strength to break glass ceilings and keep pushing forward, while also going into communities of color and telling the stories of amazing humanitarians such as Nelson Mandela, the subject of one of our ballets. It’s been really fulfilling to come full circle and not only create ballets but also engage so many deserving communities with ballet in a way different than what ABT or NYCB offers. How is The Black Iris Project organized? The project is twofold. The first part is the creation of works rooted in Black history and experience. That happens annually. We convene during the spring months to do developmental residencies where we come together and create the work. That leads up to a summer touring situation. The other part of The Black Iris Project is education and outreach. We collaborate with a lot of organizations to do master classes or lecture demonstrations at community centers or various middle schools and high schools. Last year we had a partnership with a popular charter school in New York called Success Academy. I was brought in to work with a select number of dance students in their middle school program. I worked with them throughout the semester, which led to a performance that combined the students with a professional dancer in The Black Iris Project in a work they performed for their friends and families. Our educational umbrella takes many forms but always involves reaching out to communities of color that might not have access to or an interest in ballet. How would you describe your choreography to someone unfamiliar with it? My work is deeply rooted in the human experience. I embody both contemporary and classical ballet, but most of my choreography is story driven. I was always inspired as a kid by narrative, so all my works are more or less linear. I am inspired by gesture and eye contact as forms of communication, things humans do naturally. For example, with eye contact, the body language you exude plays into different characteristics of how others might perceive you. Within my most recent ballet, A Mother’s Rite, I wanted to push the boundaries of what ballet is and how we look at ballet, so there’s a lot of acting and gestural physicality. I wanted to show that ballet can still be expanded and take on different shapes – positions can be used to express and convey emotions. It’s never the same. With Madiba, the music came first. I knew I wanted to highlight a Black historical figure who isn’t commonly talked about in the United States. I wanted to collaborate with a composer of color, and I just so happened to stumble upon a piece of music by a Black composer, Carman Moore, entitled Madiba about Nelson Mandela’s life. Growing up, I never really heard about Nelson Mandela. He was released from prison when I was very young. I knew he was eventually the president of South Africa, but he wasn’t commonly talked about in school. His story rang so similar to that of the Civil Rights Movement, I saw an opportunity to continue and further the conversation of civil rights. For A Mother’s Rite, it was also the music that came first. A mentor suggested I use Stravinsky’s Rite of Spring to explore musicality while I was in college. Sometimes it’s a theme or message I want to share, such as in Black Iris. In that instance, the idea came first before casting or music. One thing important to me is to experience life outside my discipline. I started working professionally in theater at age 15. I was always very focused on my theater and dance studies, so I didn’t have a lot of time for sports or other activities. During college at Fordham University, I got to meet people from different walks of life and faiths in ways I hadn’t been exposed to before. Especially within A Mother’s Rite, watching the news and seeing the countless Black men and women killed by police affected me and inspired me to bring those social justice stories to life through movement. You’re not only creating opportunities for people of color but also telling stories about people of color. Why is it important to go beyond just giving opportunities to people of color in existing ballet repertoire? I’ll tell you a little story. I was teaching for ABT in their education department. They had me going to schools that were heavily populated with students of color one to two days a week and teaching them ballet. The first challenge I faced was that these kids didn’t like the music. Our generation is so entranced by hip hop and pop music, when I would put on classical music, they would check out. I had to find ways to keep them engaged, but still give them the technique. In order to bridge that gap, I would play the soundtrack to the TV show Empire. I would automatically see so much more engagement and enthusiasm just by changing the music. At end of the semester, I got to take my students to the Metropolitan Opera House to see a production by ABT. I was super excited, as I had danced for the Met Opera for two seasons. Dancing in the Metropolitan Opera House had been a dream. Most of these students had never been to the opera house before, so to take them there for free was such a rewarding experience. However, after 30 minutes, the kids were completely checked out. I started to wonder why they were checked out. I think a lot of it was, although there were some dancers of color onstage, beyond that, they couldn’t see their stories or lives being represented in a way that was relatable to them. That was a huge lightbulb moment for me: These students don’t just need to see someone who looks like them in a role in Le Corsaire or Swan Lake, they need to see their stories, lives and histories told onstage. We need to give people an opportunity to see themselves. Misty Copeland has brought much visibility and inspiration for communities of color, but there’s so much more to be done within the ballet companies. We need to have companies reflect the world we live in. We can’t just tell European-rooted stories. If we really want to call ourselves a diverse nation, we should be creating ballets that reflect the diversity in our country. Ballet has a very exclusionary history with regards to racial representation. Why is it important to you to use ballet as a choreographic medium? My first instinct was: Why not? I always tell people I’m not trying to recreate Alvin Ailey American Dance Theater or Dance Theatre of Harlem. Those companies were created specifically because dancers of color were not frequently hired into other companies. There weren’t as many options or possibilities for dancers of color. Ailey and DTH are amazing companies that have paved the way for me today and I humbly stand on their and others’ shoulders. Ballet has always been a great love of mine. I think it’s important we not segregate ourselves as people of color and only focus on African-rooted forms like tap, hip hop or African dance. That creates more segregation, not the integration that we should have. If we want to talk about ballet being exclusionary, we can conversely look at the droves of white people who have fallen in love with hip hop. I believe we can draw from each other’s experiences while of course respecting the history. It’s important to find and create new ways to bring people together, and that’s one thing the dance world is really missing. Inclusivity in ballet is one of the last pieces. But it’s changing, and I’m thrilled and honored to be a part of that process. What are some shifts you’d like to see in the ballet world? I would like to see more ballets that are rooted in a vast array of cultures, perspectives and music genres. I would like to see more ballets that reflect the unique makeup that is the United States of America. This coming January 19th, our film adaptation of A Mother’s Rite will premiere on CUNY Television. It will be broadcast locally throughout the five boroughs of New York City. I’m excited to navigate new ways of engaging audiences outside of live performances. Finding ways to partner with local television networks is the next big step for us to share our ballets and stories. 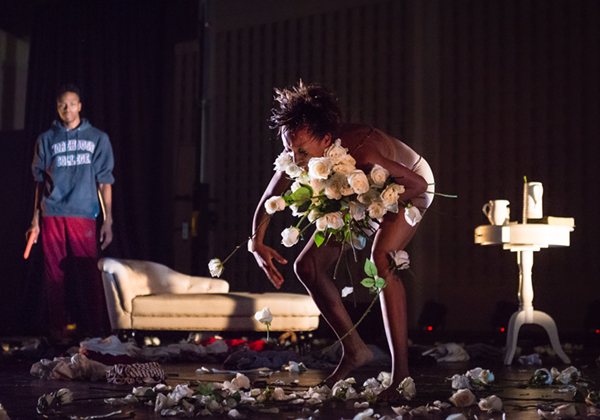 This summer, we are headed on tour to Houston, Texas and Louisville, Kentucky where we will present Black Iris, our inaugural ballet, as well as our most recent ballet, A Mother’s Rite, which traces one mother’s journey through multiple stages of grief after being thrust into the spotlight by way of her son’s murder. We’ll also be premiering a new work inspired by Hurricane Katrina and Hurricane Harvey and how these historic hurricanes have impacted communities of color. To learn more, visit www.blackirisproject.org.